Convinced that live classical music is a must? Hear Yannick Nezet-Seguin conduct Gustav Mahlerâs âResurrectionâ Symphony on Saturday, July 16, with The Philadelphia Orchestra. My most memorable experience of Gustav Mahler’s Symphony No. 2 was a live performance by the San Francisco Symphony and Chorus with Michael Tilson Thomas conducting. The performance was part of a recording cycle of all the Mahler symphonies, which gave the concert a heightened level of importance and pronounced energy. What I remember most was the end of the 70-minute musical journey. I had this feeling of buoyancy, almost of being lifted up, as the music neared the end. The closing choral text makes the title, “Resurrection,” seem inevitable: “I shall die so as to live,” and the words soar with the sound of bells and brass fanfares. With our mobile devices in easy reach at all times, we can listen to the latest Taylor Swift single (yes, I’ve done that), look up the population of Denver, read a review for a nearby restaurant or get directions to just about anywhere in the world. You can also download Mahler’s Symphony No. 2 and listen to it through your wireless Bluetooth speakers or ear buds in any location you choose. 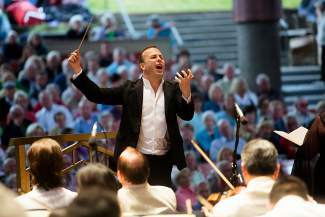 But instead, we will choose to gather together on Saturday, July 16, at the Gerald R. Ford Amphitheater in Vail to hear maestro Yannick Nezet-Seguin’s interpretation of Mahler’s masterpiece with The Philadelphia Orchestra performed live. • Community: Performances are a communal event. Sure, we want to hear the music, but the concert experience is heightened when we share it with others. • Visual: We now have access to astounding, high-quality video production in live concert performances such as Met Opera Live or the Berlin Philharmonic’s digital concert hall. But at a live performance, you get to choose which musician you watch in any given moment. You decide if you want to focus on the principal cellist, the bass section or the timpanist — or close your eyes and just feel the energy of the moment. You create your own visual experience. • Social: It’s fun to see friends at concerts and to share your favorite moments with them at intermission or at dinner afterward. And we all feel the energy of the moment with one another as we listen to a live performance together. By the way, it’s OK if you want to Tweet about the great time you had or post a selfie on Facebook or Instagram. These days, sharing your experience on the web counts as part of the experience. • Beautiful setting: Whether you are listening in a concert hall or in the spectacular setting of the Gerald R. Ford Amphitheater, the listening environment is an essential part of the experience. When I am hearing an orchestra live at the Ford Amphitheater, I am linking the beauty of the flowers, trees and clouds with the music leaping off the stage. And every once in a while, nature becomes an inexplicable part of the performance — a gentle breeze, thunder, birds or squirrels! Jennifer Teisinger is the executive director of Bravo! Vail, which runs through Aug. 6. For more information on the season and to purchase tickets, visit http://www.bravovail.org or call 970-827-5700.